An engine fault that grounded planes at British Airways and other airliners will take "some years" to fix, Rolls-Royce has said. The aerospace giant said parts in its Trent 1000 engines were wearing out faster than expected but that it "had a solution" to the problem. It came as Rolls-Royce reported better-than-expected results for 2017, following a record loss in 2016. However, it signalled job losses ahead as the firm continues to cut costs. In December, Air New Zealand became the latest airliner to ground some of its flights because of problems with its Rolls-Royce engines. It said there had been "two recent events" involving Trent 1000 engines, one which required the plane to return to the airport after take-off. Image caption In December, Air New Zealand became the latest airliner to ground some of its flights because of problems with its Rolls-Royce engines. Japan's ANA and Virgin Atlantic have also had problems. Rolls-Royce said up to 500 Trent 1000 engines - used on Boeing 787 planes - and some Trent 900 engines had technical problems. Boss Warren East told BBC Radio 4's Today programme: "First you have to realise that all mechanical things wear out over time, and some of the parts in our Trent engines are wearing out faster than we originally forecast. "We're having to manage the operational impacts because it's quite disruptive for our customers." He added: "We have a solution, we have a plan, it will take some years to fully implement the modifications in all the engines which are in service." The firm reported better than expected earnings for 2017, with profits before tax of £4.9bn. It follows a £4.6bn loss in 2016 - the largest in Rolls-Royce's history - due to settling corruption cases and currency hedges going wrong, among other factors. The news pushed shares in the company up by more than 14%. 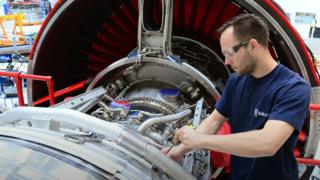 The firm attributed its performance to stronger sales of aero and diesel engines, as well as a £2.6bn accounting boost from the recent strengthening of the pound. However, it said its 2018 figures could be impacted by the cost of carrying out the Trent engine repairs, and also that it would push ahead with a plan to "simplify its staff structure" to cut costs. This would see it reduce its number of business divisions from five to three. Mr East suggested corporate roles would be affected but stressed the revamp was not set to affect engineers or technologists. "It is too early to comment on specific numbers of job losses, but what I have been talking about for some time is we need to simplify our operation," Mr East said.